Provide dynamic information to passengers and enhance the travelling experience. Ease of delivery and distribution - no need to print. Make it easier for customers to organize and track passes. Leverage your existing systems - since all information to be printed on paper tickets is already on the system it's easy to create a digital version. 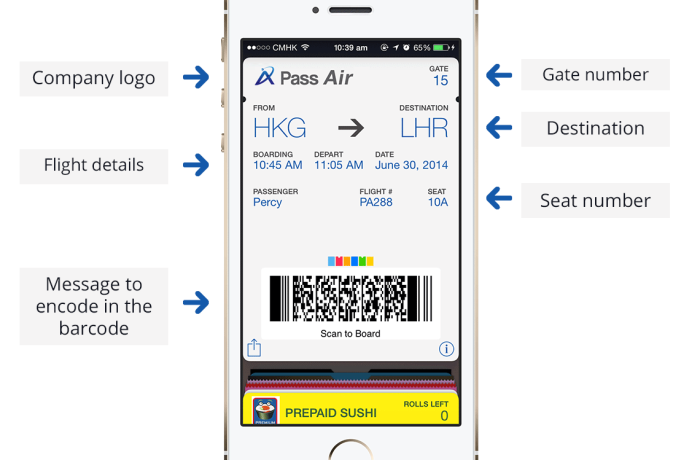 Click on 'Add' to add the boarding pass to your mobile wallet. Use a 2D scanner or a scanning app (we recommend Manatee) to scan the barcode to reveal a message from the Pass.